Portable "brick" light features 4 bright LEDs and classic LEGO® styling. The LEGOr Portable LED Brick Light is, for lack of a better word, awesome. This is mainly due to the fact that it's made by LEGOr, but also because it's incredibly bright, comes with batteries (yes! 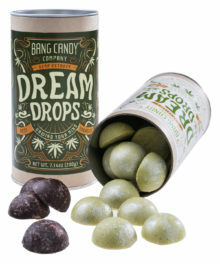 ), and is designed for portability. The LEGOr Brick Light includes a mounting plate for installing the unit on a wall or underneath a cabinet. Because the wall plate snaps into the back of the light like normal LEGOr bricks, the light can easily be removed for a late-night trip to the kitchen or bathroom. Available in red or blue. Requires 3 AAA batteries which are included. 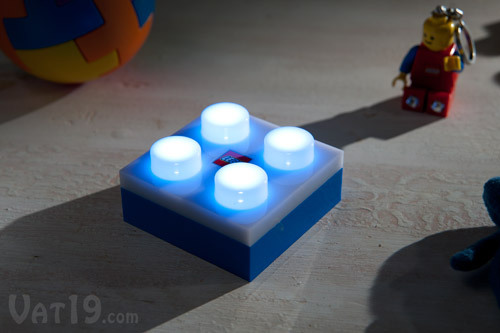 Dimensions: 3" x 3" x 1.75"
Portable, bright LED light...that looks like a LEGO®! The LEGO® LED Brick Light is a fairly simple device. Press the LEGO® logo and it illuminates its four "pegs". What makes this so curiously awesome is that it looks like a LEGO® brick! Seriously, who doesn't love LEGO®s? 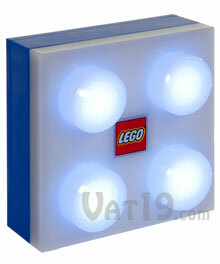 The LEGO® LED Brick Light features four bright LEDs embedded inside its four "pegs". 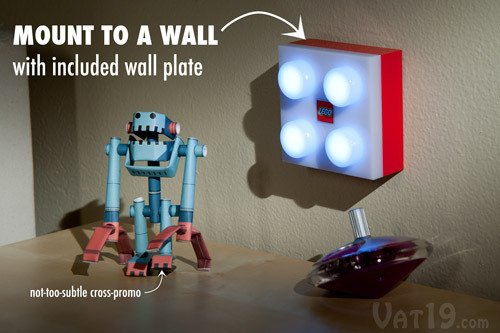 The LEGO® LED Brick Light includes a wall plate for easy installation on any wall. Place the LEGO® Brick Light on a wall with the included wall plate and give your Muscle Joe Piperoid some illumination. The LEGO® Brick Light includes a wall plate that can be mounted pretty much anywhere; you'll just need two screws (not included). Using the included wall plate, you can install your LEGO® Brick Light just about anywhere. 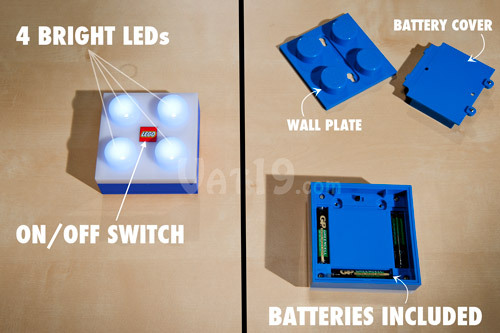 The mounting plate attaches to the LEGO® Brick Light in the same manner that all LEGO® bricks connect to each other. So, removing the light from a wall or from underneath a cabinet is simple: just pull. 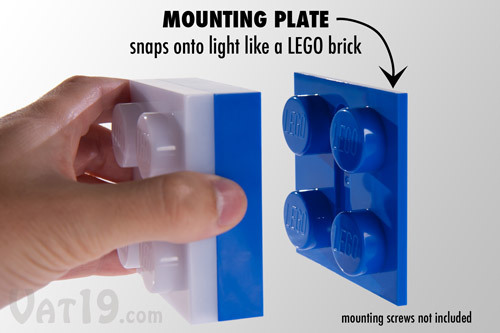 The LEGO® LED Brick Light snaps easily onto the included mounting plate. 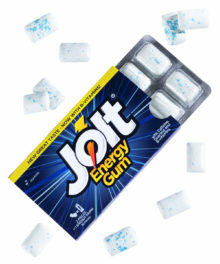 At Vat19.com, we love it when products come with batteries. 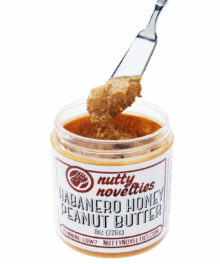 It just makes for a perfect gift when the recipient can use the item immediately. 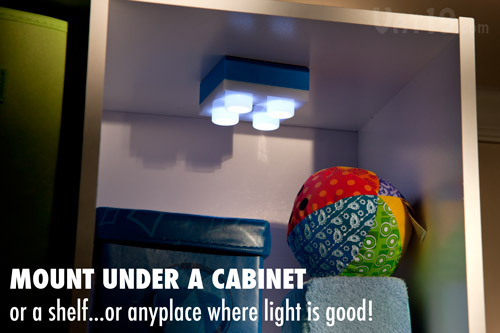 And the LEGO® LED Brick Light just so happens to be one of those perfect gifts. It requires 3 AAA batteries which are included. 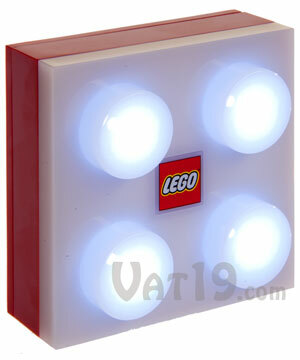 The LEGO® LED Brick Light requires 3 AAA batteries which are included. 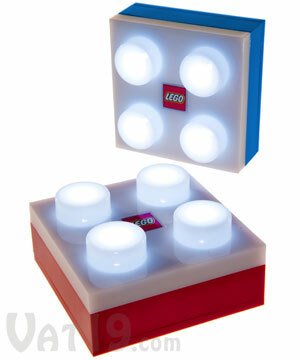 The LEGO® Brick Light is available in red or blue. 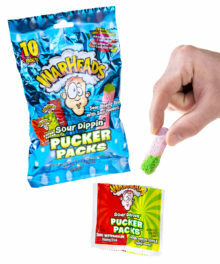 You should probably buy both.